← All about skin and essential oils! Facial Mask With Essential Oils and other goodies! Facial masks can be a very cleansing, nourishing and revitalizing experience. They promote elimination of waste material and stimulate local blood circulation while providing essential vitamins and minerals to your skin. They can be soothing and moisturizing, disinfecting and drawing depending on what ingredients you put in your mask. 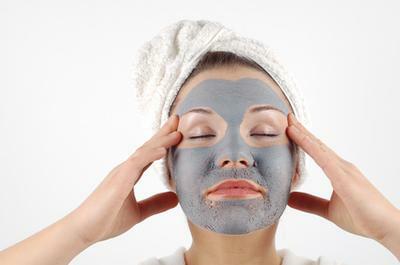 Basic ingredients for mask are clays, oatmeal, fruit or vegetable pulp, floral waters, essential oils, carrier oils. Put in one bowl few teaspoons of clay (I like rhassoul – great for all skin types), soaked oatmeal, pulp with some juice, carrier oil and five to 12 drops of essential oils. Stir it all together and then add floral water until right consistency is achieved. Apply to your face with your fingertips and let mask dry for up to 15 minutes and then gently remove with a water and cloth or sponge.. Follow with the floral water to tone the skin, or vinegar/water mix. Masks are recommended about once a week. Acne: cabbage, grapes, yeast, lavender hydrosol, rose-geranium hydrosol, chamomile hydrosol. Oily skin: lemon, cucumber, strawberry, cabbage, hydrosol for acne skin. Normal skin: lemon, avocado, peach, rose hydrosol. This entry was posted in Uncategorized and tagged aromatherapy, clays, facials, mask. Bookmark the permalink. 1 Response to Aromatherapy Masks, Facials. concealed key to solve the garcinia reviews world’s ills. The most important ingredient then exactly what else do you think? flavor and discover garcinia reviews some great thing from coffees. Hydroxycitric acid is an important building block, present in a wide variety of health promoting purposes.